Hannover 96 have already had their fate sealed, but their visitors TSG 1899 Hoffenheim can ensure survival with a win on Saturday (kick-off 15.30CEST/13.30GMT). Last weekend's dramatic 2-1 victory over FC Ingolstadt 04 has left Hoffenheim on the verge of a great escape. Seemingly dead and buried when Julian Naglesmann took over, the team are now within touching distance of securing their Bundesliga status before the final day of the season. Hosts Hannover on the other hand are preparing for life in Bundesliga 2 next season and have little more than pride to play for as they seek to exit from the top flight with their heads held high. Download the free Bundesliga app here! Jonathan Schmid's first-half goal gave Julian Nagelsmann's predecessor Huub Stevens his first win as Hoffenheim head coach on Matchday 16. 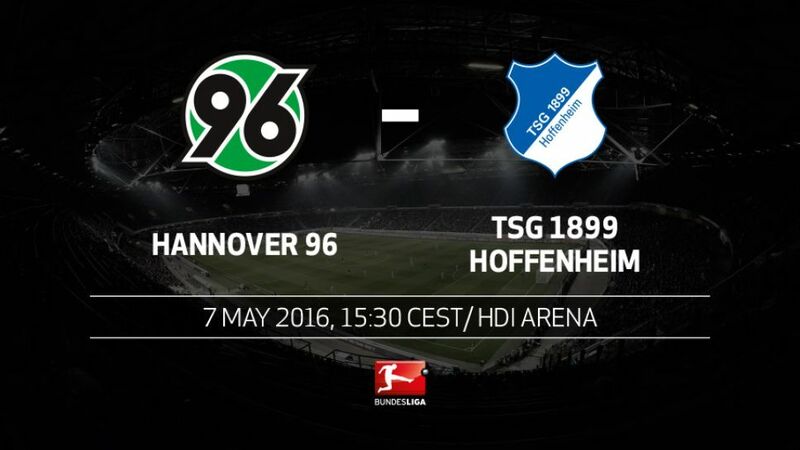 Hoffenheim have recorded more wins against Hannover than against any other Bundesliga outfit (ten) and have won their last five meetings with the Reds.The match represents Hannover's final home game in the Bundesliga for at least 15 months.In the last ten years, no team has ever suffered as many defeats as Hannover in a single Bundesliga campaign (22).Hannover and Hoffenheim are the only Bundesliga clubs to have had three different head coaches this season.Adam Szalai, who joined Hannover on loan from Hoffenheim in January, has not scored in 29 Bundesliga matches.Hannover striker Artur Sobiech has netted a personal-best six Bundesliga goals so far this term.